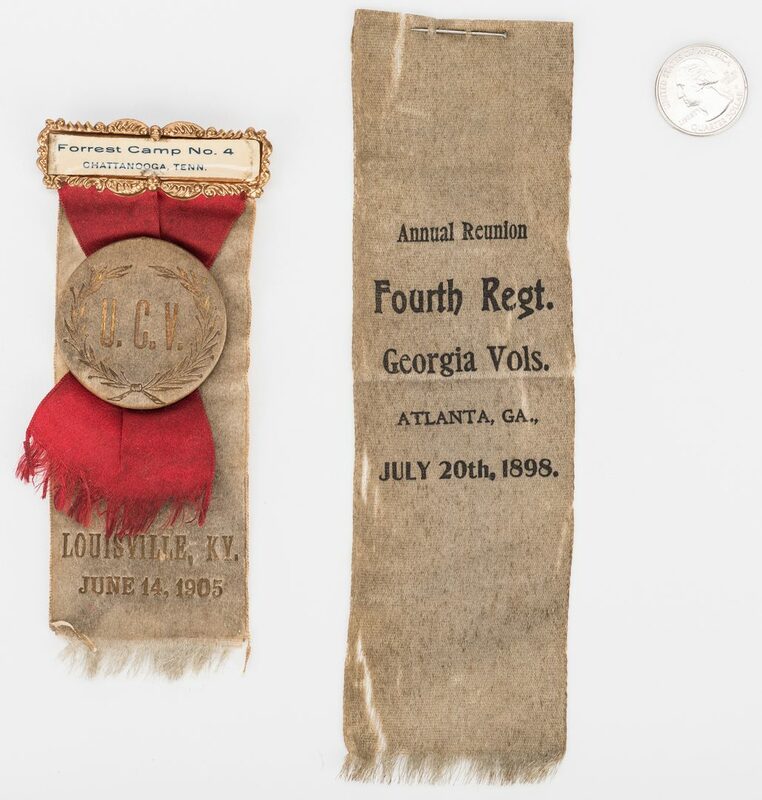 Two (2) United Confederate Veterans reunion ribbons. 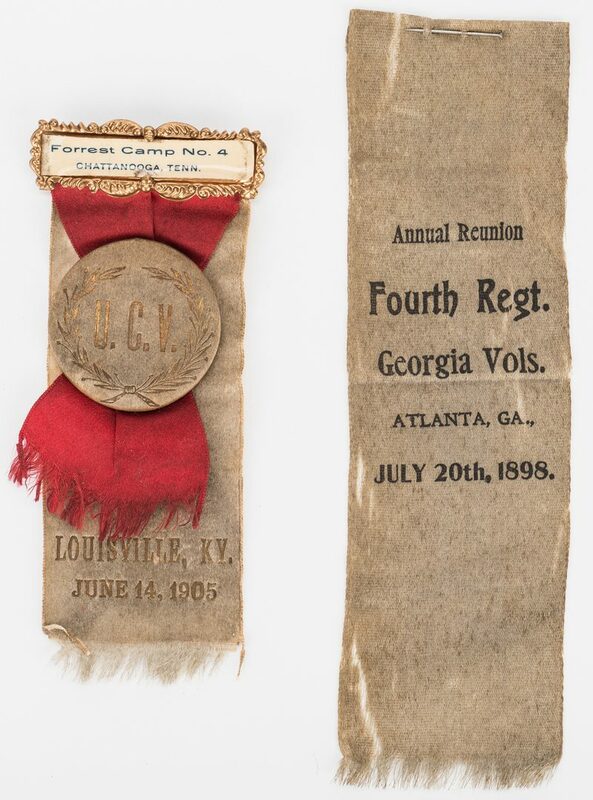 1st item: Louisville, KY UCV reunion badge, June 14, 1905. Consists of a metal hanger with "Forrest Camp No. 4 Chattanooga, Tenn." with two silk ribbons, one red with a silk covered button with "U. C. V." in a laurel wreath and one off white ribbon. 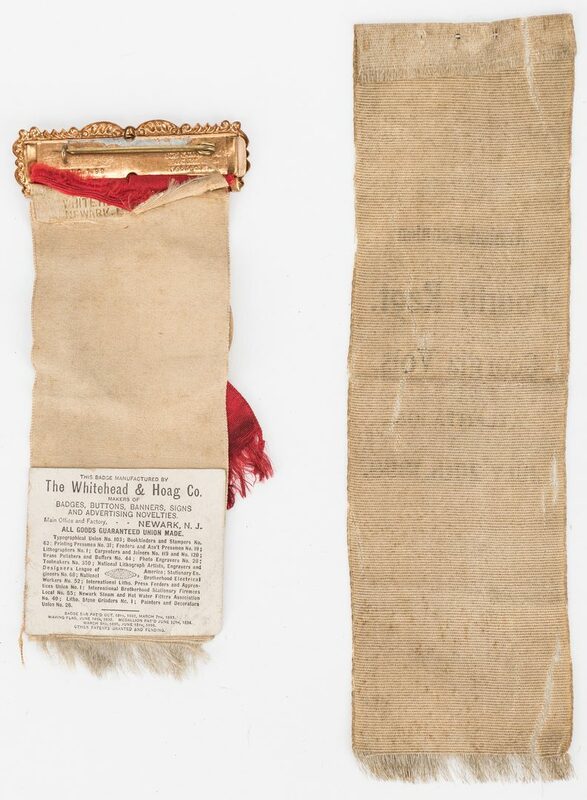 Manufacturer's marks for the Whitehead and Hoag Company, Newark, NJ, back of hanger and button. 5 3/8" H x 2 1/2" W. 2nd item: Atlanta, GA Fourth Regiment Georgia Volunteers UCV reunion printed silk ribbon, July 20, 1898. Includes stick pin, top of ribbon. 8" H x 2 3/8" W. Provenance: Private Ringgold, Georgia collection; among items purchased in the 1960's from the old location of the A. P. Stewart Chapter of the UDC (United Daughters of the Confederacy), formerly the Nathan Bedford Forrest UCV (United Confederate Veterans) home, St. Elmo, Chattanooga, TN. CONDITION: 1st item: Overall good condition with stains, fraying, etc. to be expected from age. 2nd item: Overall good condition with stains, fraying, etc. to be expected from age. Areas of separation, largest 1 1/2", surface of ribbon.